The science corner of the internet has been abuzz for the last 2 days about the discovery of Kepler-22b—the first somewhat Earth-sized planet in the habitable zone of a Sunlike star. 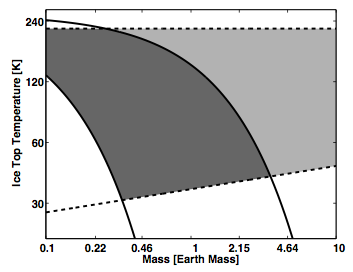 But as Ellie mentioned in her recent astrobite, we don’t know the composition of Kepler-22b or even its density. And even if we found an Earth-sized, Earth-mass planet close to the habitable zone of a Sunlike star, how would we know that its not more like Venus—which has harsh surface conditions that could not harbor life—than our own world? Venus transits the Sun, from the frame of the Earth, about twice every century, with the two transits separated by eight years. The last one happened in 2004, and another is happening in June 2012. Observing the transmission spectrum during the 2012 transit—and comparing it to measured transmission spectra of the Earth, taken during lunar eclipses—will tell us how hard it will be to distinguish two planets that look identical in mass and radius, but have extremely different atmospheric properties. The authors of this paper lay out a model of the transmission spectrum of Venus from ultraviolet wavelengths through the infrared. In contrast to the models we use for exoplanets, which are relatively unconstrained by observations, the models of Venus can incorporate data from missions to Venus such as the Venus Express to build an accurate transmission spectrum. They incorporate the absorption by atoms and molecules in the gas phase and in the condensed phase. We know that Venus has two cloud layers in its atmosphere: one is a thick cloud deck and the other is a thinner haze layer. Both layers are made of sulfuric acid, but they have different structures and particle size distributions, which causes them to scatter light differently. The most prominent difference between the transmission spectrum of Venus and Earth is the type of scattering that dominates in the UV and optical wavelengths. On Earth, the transmission spectrum is dominated by Rayleigh scattering—the scattering of light by particles much smaller than the wavelength of light, which makes our own sky appear blue. On Venus, the spectrum is instead dominated by Mie scattering—the scattering of light by particles similar in size to the wavelength of light—by the particles in the cloud and haze layers. The authors test different sets of particle distributions to analyze this effect. The authors also note that the infrared carbon dioxide lines would look different in a transmission spectrum of Venus and the Earth because of the temperature structure of the atmosphere. While Earth has a hot (~1000K) upper atmosphere, in which signatures of particles should be easier to detect, Venus has an upper atmosphere that is efficiently cooled, a signature of a very strong greenhouse effect. Hence, a non-detection of carbon dioxide in the upper atmosphere of a planet could be used to estimate the strength of the greenhouse effect, surface temperature of a planet, and assess the habitability of that planet. Venus and the Earth make a very nice laboratory for analyzing the transmission spectra of a habitable planet and un-inhabitable because we have so much more information about the compositions. By comparing the recovered composition from a measured spectrum to the known compositions of Venus and Earth, we can assess how well this technique will actually work for similar exoplanets we’re trying to characterize. How can an atmospheric absorption spectrum be in PPM? And how does one interpret the different color lines on the top portion of the graph – is there no “total atmosphere” absorption spectrum? I was looking for a Venus atmospheric absorption spectrum to run some rough calculations on whether a large floating solar chimney on Venus could theoretically eject the atmosphere at greater than escape velocity (potentially even Mars-intercept velocity) and thus be used for terraforming Venus and/or Mars. But I’m not sure how to interpret this graph.